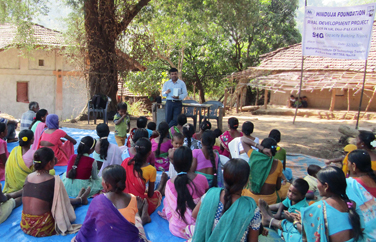 The Foundation aims to enrich the lives of those living in the rural areas of India. In the socio-economic landscape of the country, there is a lack of livelihood opportunities in the rural communities. Hinduja Foundation aims to correct this imbalance with its timely initiatives and programmes in the rural and remote areas of India. The Hinduja Foundation is the implementing agency for Rural Development Projects and programs mandated by respective Company Boards as part of their CSR projects u/135 of the Companies Act 2013. The CSR programs and activities are implemented on behalf of Ashok Leyland Ltd., Hinduja Group Ltd., Hinduja Realty Ventures Ltd., Hinduja Finance Ltd., Hinduja Ventures Ltd, Gulf Oil Lubricants India Ltd., Gulf Oil Corporation Ltd., Hinduja Global Solutions Ltd., HGS International Services and Indusind Media & Communication. The objective of the Hinduja Foundation Rural Development Project in Jawhar is to enhance the livelihood of the project participant communities through a 360 ° farm based interventions in the form of improved agriculture practices, Wadi tree based farming, support to landless & women headed families, and bring about improvement in their quality of life through income generation and development of model villages, enhanced health and sanitation facilities, water resource management, upgradation of educational facilities, empowerment of women and development of the village infrastructure. The upgradation of Primary Health Centres and the deployment of a fleet of Mobile Medical vans are other major initiatives undertaken by the Hinduja Foundation in Jawhar taluka with the support of Hinduja Group Companies. Over 90,000 patients have been treated in the period 2011-17 through the Mobile Medical Units of the Foundation. In 2016-17 11 specialty camps were conducted by the Hinduja Hospital consultants and doctors and OPDs have provided access to more than 300 padas (hamlets). A 'Need Assessment Survey' exercise was undertaken in 28 villages of Jawhar taluka. After undertaking baseline survey and its analysis, a detailed Project Report (DPR) was prepared for undertaking comprehensive development activities comprising of livelihood promotion, improvement in quality of life, women's empowerment, village infrastructure development and training of the community in relevant activities. The project titled as 'Hinduja Foundation Sustainable Rural Development Project, Jawhar' commenced from the month of June 2015 with expertise from BAIF. 5 villages were selected for implementation of the Project in the first phase from 2015-20 and another five villages in the second phase from 2017-22. The project continues to run smoothly owing to the coordination with the Govt. authorities, partner NGOs, Panchayats and villagers. The Foundation works extensively to foster sustainable agricultural practices and inculcating the principles of farm management to the villagers, building their capacities to utilize better practices with better techniques. A plan is created with the Gram Panchayat and the villagers to help identify the resources existing and help the community to realise its assets and then work forward from there on. The Foundation has been working to improve the yields of rural areas by introducing Improved Agriculture Practices among the Project Participants and reduce the dependency on few crops by encouraging diversity of cropping for long-term sustainability. The Project supports cultivation of finger millets, vegetable cultivation, Rabi crops and support for floriculture cultivation. Paddy is the main crop of rural areas and also the staple diet of the tribal families. However, the productivity of paddy is very low at about 3-4 quintals/acre. There is ample scope for improvement in the productivity by motivating and educating the farmers to adopt improved cultivation practices. 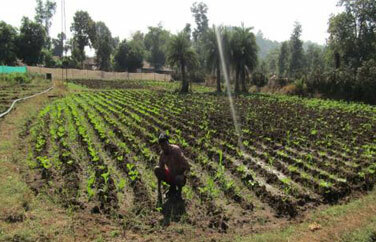 The Project supports improved cultivation of Paddy on plots of 10 R (100 sq. meters). Total of 21.50 Acres have been covered under this activity. It was found that per acre yield of Paddy ranged between 5-6 quintals (average 5.30 quintals), which is 20-25% higher (average 22 %) than traditional form of cultivation. Soil conservation activities are undertaken in the Wadi plot to enhance soil fertility by the Foundation. Water management activities are also undertaken in the Wadi to ensure sustainability as availability of water for irrigation is critical. 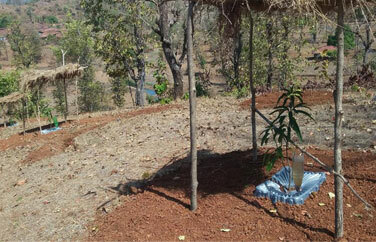 20 mango and 40 cashews have been planted in each Wadi. 200 forest plants of different native species like bamboo and teak are planted as surrounding barrier trees. Growth and survival of both horticulture and forest plants is essential for this activity to succeed. Periodic assessment of survival is undertaken in the month of December. Landless families are unable to garner productive resources for their livelihood. The Foundation, through its projects, has extended its support to 3 landless and 5 women-headed families identified with the help of Panchayats and villagers to generate income. Suitable activities have been identified after the visit to families and the resources available to them. Water is a critical component to sustain farming. Rain-fed agriculture is fraught with uncertainties because of the pattern of rainfall. Therefore, the Foundation strives to ensure availability of water both for irrigation and for meeting the drinking water needs of the community. Water Resource Development through the Deepening of Wells. The Project undertook the deepening of the open wells to tap live underground sources of water and to increase storage capacity of the well. 9 wells were dug during the reporting period which benefitted about 41 families on 69 acres of land. Group Water Lifting Device is a mobile unit that consists of a diesel pump set and pipes. Members of the Water-User-Groups use the set in rotation for irrigating vegetables in Rabi season. Fuel is provided by the farmers. Water scarcity is a huge problem during the summers. 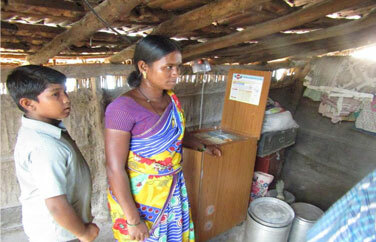 A pilot project provided solar-powered lift from nearby wells for drinking in Shingarpada village. 115 families benefited from getting drinking water at their doorstep. 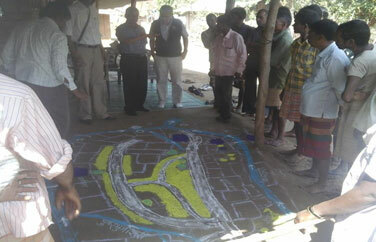 Training in various skills involving agriculture and allied activities is provided to the participant community. Exposure visits are organized so that participants learn by observing how specific activities are undertaken by farmers in developed areas. The visits provide a wonderful opportunity for farmer-to-farmer interaction and learning, which is most effective in convincing and development of confidence. In India, women constitute half of the total population. A majority of women in rural areas are voiceless and depend on the men for their livelihood. The Foundation aims to bring a positive change in the lives of the women in the rural areas. SHGs play a key role in the empowerment of women so that they can effectively mobilize community in general and women in particular. It gives a platform to empower women through social development and financial independence. The Project is making efforts to build capacities of members of the women's SHGs through numerous need-based trainings. The office bearers are trained in various skills for the efficient functioning of the SHGs. One of the vital functions of SHGs is regular saving and credit. The SHGs meet at a fixed interval of week, fortnight or a month to deposit their savings and for repayment or disbursement of loans. Apart from this, several community and development issues are discussed and numerous decisions are taken. It is essential to document and keep relevant records to maintain transparency. The project has provided support to purchase relevant records and printed stationary. Saving and Credit activity and financial linkages developed with banks and government schemes involve financial transactions. An accurate record has to be maintained for transparency of operations and for periodic auditing. Educated youth in the community are trained to maintain the record as per standard procedures and are affectionately called 'barefoot accountants'. Exposure visits of the SHGs in the Project have been organized for outstanding and exemplary SHGs in the nearby areas. Capacity building training was given to office bearers of existing POs. The Foundation has carried out several innovative schemes during the roll-out of the project. 43 TCDs have so far been constructed with sand bags in the taluka in support of the Rural Development program. These dams have helped in arresting monsoon flows and improving irrigation supply to the farmers for floriculture and vegetable growing for an additional 2-3 months. Talia trays of Israeli design have been used for conjunctive use of water for irrigating horticulture plants by funneling available water like scattered rainfall and dew. Trial with 200 trays is being undertaken at Pimplashet and Kharonda. Several schools in the area are in great need of intervention. Development of two Ashram residential tribal schools and 15 Zila Parishad schools in five villages into holistic innovative learning centres with the aid of specialist NGO in Chambarshet and Ozar is being undertaken in 2017. Initial surveys have been completed. Transforming two Ashram residential tribal schools, an Ashram school for girls and 7 Zila Parishad schools in the Jawhar taluka villages into holistic innovative learning centres has been scuccessfully implemented. 3,875 students from the 10 schools, 10 principals, 69 teachers and 1542 community children from 50 adjoining hamlets have benefited.